Portman Road has a current capacity of 30,311 after redevelopment in the early 2000's of both North and South stands. In the past ten years, statues of both Sir Alf Ramsey and Sir Bobby Robson have been unveiled outside the stadium. The North Stand was renamed in honour of former manager Bobby Robson before a game with Newcastle United in September 2009. There are very few bad seats in the house and there's generally a very good atmosphere. Up to 1,900 visiting supporters can be catered for and are allocated one side of the upper tier of the Cobbold Stand at one side of the pitch. The view is very good unless you're at the very back although the leg room is rather tight and in the summer it gets incredibly hot and uncomfortable (trust me). Facilities are very good and the food is what you'd expect to find with the usual burgers, hot dogs, pies and chips at reasonable prices. For away fans, the choice of drinking establishments is very limited. The station hotel between the train station and the ground is as good a bet as you're likely to find. In the town centre, there are many more to choose from but probably still best to keep club colours hidden until you leave. In the town centre there's a wide array of fast food outlets such as McDonalds and Burger King along with a few nice Chinese and Italian restaurants for those wanting something more substantial. There are three pay and display parks along Portman Road with a total of approximately 800 spaces. It costs £3.50 to park your car for the Saturday afternoon. However, early arrival is recommended to ensure a space as street parking is very limited in the surrounding areas. Ipswich train station is less than half a mile away from Portman Road, and the ground is visible from the station. Upon arrival at Ipswich train station you will simply come out of the entrance and onto Princes Street. You'll be able to follow this over the bridge and all the way up to the stadium which will be on your left as you approach. Trains run in to Ipswich from Liverpool Street and also from Peterborough. Travel: Despite the ground being so close to the town centre, there is a lot of available parking, and even the usual city centre parking has a lot of deals on for match days. I parked on a little car park on Ranelagh Road near the station, and it only cost £3 for the whole day on match days, and only a few minutes walk to the ground, and easy getting out after. Couldn't be better. Refreshments: The ground has one of the best locations of any ground I've been to, right near the town centre, loads of pubs (only criticism would be that most of them had signs up for home fans only, and some were even asking to see match tickets on the door, so even just not wearing colours wouldn't do any good in a lot of places) loads of places to eat, again, couldn't be better. Impressions: The ground has a very good look about it. 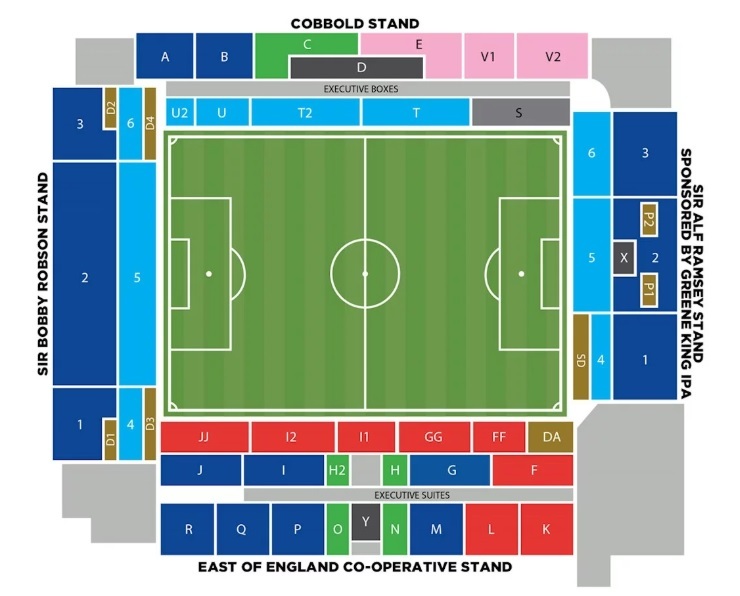 The two side stands are the older ones, but still mostly good views, the two tiered Cobbold Stand down one side, which contains the away section, and the three tiered East of England Stand opposite. The stands behind both goals were redeveloped when the club were last in the Prem and both look very similar, with a smaller lower tier, and a big steep upper tier. Atmosphere: Great where I was, in the lower of the Sir Bobby Robson Stand. The whole lower tier stood for the whole game and never really stopped. Brighton fans were poor. Enjoy: Great ground, great location. About the only negative I can find is that's its so far away! Would love them to get back to the Prem and go there more often. Have you been to Ipswich Town's Portman Road? To tell us about your experiences and to feature on the site, simply complete the fans review form below!